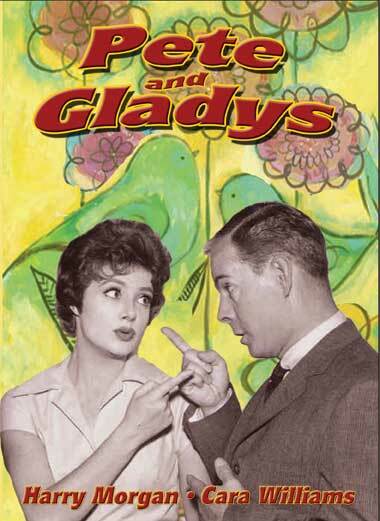 When December Bride ended its run after five successful seasons in 1959 the television comedy Pete and Gladys was spun off as a new series. Harry Morgan reprised his role as Pete Porter. This rare collection includes 24 episodes in a 6 DVD set. Excellent quality film transfers. In December Bride, Pete Porter (Harry Morgan) was the next-door neighbor who spent most of the time complaining about his scatterbrained wife Gladys, who never was seen. In this spin-off series, she was seen, and heard, in the form of redheaded comedian Cara Williams. For Pete’s Sake (Pilot), Movie Bug, Oo-La-La , Pete’s Changing Personality, Gladys and the Piggy Bank, No Man Is Japan, Misplaced Weekend, Gladys Rents the House, Cousin Violet, The Orchid Story, Secretary for a Day, Gladys Goes To College, The Hoarder and the Boarder, Money, Money-Who’s Got the Money?, Uncle Paul’s Insurance, Lover Go Away, Hero in the House, Who Was That Man?, Garden Wedding, Follow That Skeleton, Will the Real Michele, Tabour Please Stand Up?, The Prize, Never Forget a Friend, Sleepytime Wife.